4. Earn an Open Water SCUBA Diver Certification from an organization recognized by the Boy Scouts of America scuba policy. HOT NEWS! 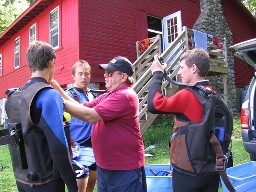 SCUBA DIVING MB will return this summer to Resident Camp at Camp Sequassen! This summer you can earn the SCUBA Diving Merit Badge, including NAUI Open Water SCUBA Diver Certification, while attending a week of Scouts BSA Resident Camp at Camp Sequassen! 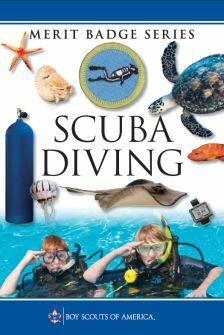 The SCUBA Diving Merit Badge program will be available during all seven weeks of camp! Any Scout, MALE OR FEMALE, whether attending camp with a unit or as a provisional, may participate in the program. Registered adult Scouters may also enroll. Completion of the week long program earns participants the Scuba Diving Merit Badge and NAUI SCUBA Open Water Diver Certification. The program runs Monday through Friday, 9:00 to 5:00, but there will be opportunity to engage in open programs in the evenings. To enroll, email your name, Troop #, and week attending to: CaptSteve@ScubaConn.com. Download the program brochure HERE. Download the enrollment forms package HERE. Download the MB workbook HERE. Enroll early!! Enrollment deadline is May 31! 1. How old do I need to be to participate in this program? Scouts must be 14 by June 30th. 2. How much does this program cost? Cost for the entire program, iincluding SCUBA certification, and all other requirements is $295, plus the cost of the week at camp. 3. How good a swimmer do I have to be? You must be a blue level swimmer and have earned the Swimming Merit Badge. 4. Are there any other prerequisites? Having earned First Aid Merit Badge is strongly recommended. Also the BSA requires physician approval for diving on the RSTC medical form. This form is required IN ADDITION to the regular camp physical form.